Akinalytics has a wide variety of equipment and capabilities available both for contract research as well as available for lease. Listed below is equipment broken down by laboratory usage. This is not an all-inclusive list so contact a representative to discuss your project or equipment rental needs. If you are interested in renting time on certain equipment or usage of Akina facilities, contact us. Akinalytics has a fully functional, aseptic, biological laboratory equipped with an U.V. Sterilizing Laminar Flow Hood (Esco class II), a Yamato steam sterilizing Autoclave, an ethylene oxide sterilizer (Andersen Sterilizer), an Orbital Shaking Incubator (Model SHKE4450, Barnstead), a 5% CO2 incubator (VWR symphony) and multiple inverted light microscopes for both normal viewing and fluorescence (AM scope). Akina Inc. maintains stock cell lines including MCF7 (breast cancer), CCD-1068SK (fibroblasts), HEP G2 (Hepatic), Vero (African green monkey kidney cells), and others. Note, Akinalytics does not market or distribute these cell lines, but they are available for contract research and testing. Akinalytics has a fully functional chemistry lab equipped with Analytical balances, Vacuum Pumps, pH Meter (Fisher, AB-15), Bath sonicator (Branson, 5510), Chemical Fume Hoods, Orbital Shaking Incubator (Model SHKE4450, Barnstead), U.V. Vis Spectrophotometer (Genesys-10S), HPLC (Shimadzu). In addition, this lab is fully stocked with most common chemical reagents. This lab can be utilized to perform chemical analysis and for sample preparation. Akinalytics has a fully functional analysis lab equipped with an FTIR (Thermo Mattson, Satellite FTIR, Model 960M0017), fluorometer (Turner Quantech, Model FM109515), rheometer (AR-550, TA instruments) mechanical tester (Texture Technologies Corp., Texture Analyser, Model TA-XT plus), and differential scanning calorimeter (DSC Q-2000 TA instruments). In addition to chemical analysis, this lab can be utilized to characterize and define polymer samples. 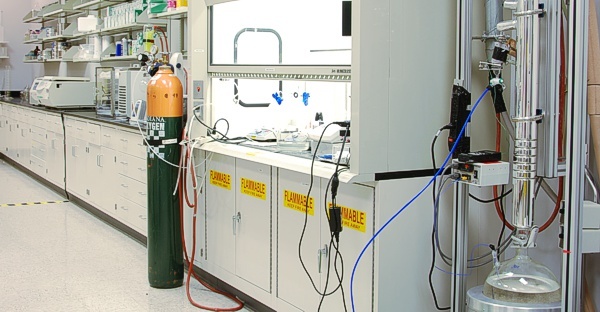 PolySciTech houses a fully climate controlled polymer synthesis laboratory. This low-humidity laboratory has precision temperature controlled magnetically stirred glass reactors, Duoseal deep vacuums for oxygen/humidity removal, argon and nitrogen purge gasses available as well as reaction set-ups for UV initiated/heat initiated polymer synthesis reactions. View a complete catalog of products that come out of this lab. We can perform custom polymer synthesis in this lab. Contact us to learn more.